As many know, we make all of our own glazes with the exception of two (we have about thirty) and we are constantly experimenting to come up with new glazes. Often we create a new glaze by layering one tried and true glaze over another tried and true. It is interesting to realize that it is not combining colors that we do. 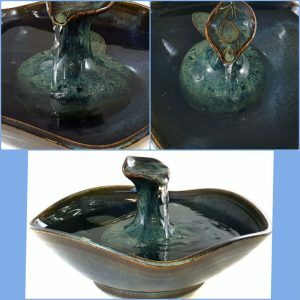 For example using a blue glaze with a yellow glaze will almost certainly not give you a green glaze because it isn’t colors we are combining but minerals. The glaze shown here is created by layering our Mahogany over our Ebony and the color variations are to us, remarkable and very beautiful. We hope many of you will feel the same. We call it Forest Moss.